Wasps do nature a service by feeding on undesirable insect pests, but when they come too close to humans they present a problem. Although they tend to avoid human contact, wasps sometimes build their nests on structures occupied by people. When humans get too close to the nest for comfort, wasps are known to attack with painful stings that cause severe allergic reactions in many people. 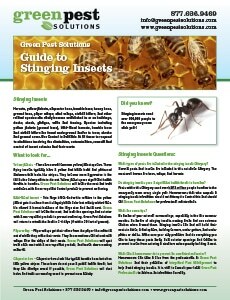 Because of the dangers of these stings, it’s wise to seek the help of an exterminator to safely remove a wasp nest. If you choose to go the DIY route, there are a few ways to remove one yourself. Read on to learn more. Are You Allergic to Wasp Stings? Know the answer to this question before you attempt to disrupt a wasp nest. If you don’t know, make an appointment with an allergist or doctor to be sure. Wasps build their nests in spring, so remove a nest right away when you see one before the queen lays eggs and the colony’s population multiplies in summer. Wear boots, heavy long pants, a jacket, hooded sweatshirt, hat, work gloves, and goggles before approaching the nest. Be sure to put rubber bands at the cuffs of your jacket and pant legs to prevent wasps from flying into your clothing. Buy an aerosol spray specifically designed to kill wasps. Any other type of insecticide might not be strong enough to kill every wasp inside the nest. Apply the insecticide at night, as this is when the insects are less active, so most will be inside the nest. Spray the entire can into the nest and retreat instantly in case any angry wasps come out. Wait the amount of time indicated on the can’s instructions and go back to look and listen for any signs of activity within the nest. If all seems quiet, you can remove the nest. Insecticidal dust is more effective for ground nests. Just as you would with aerial nests, wear protective clothing and approach the ground nest at nighttime. Appy the dust to the nest opening and retreat. The wasps won’t die right away. They’ll come and go, eventually coat themselves with the dust, and bring the insecticide into the nest where they poison the others in the colony. Because of the dangers associated with removing a wasp nest yourself, many decide to use the assistance of qualified professionals. The expert pest professionals at Green Pest Solutions know how to safely remove a wasp nest without causing danger to you, your family, or your pets.